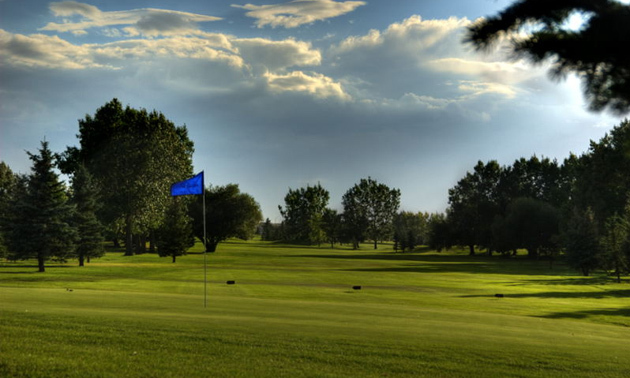 As Southern Alberta’s only championship golf club offering 27 holes of play, the Picture Butte Golf Club has a wide variety of holes and strong availability. In 2005 the club renamed the three nines to highlight the farming culture of the local community. 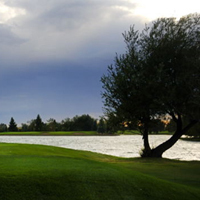 The original front and back nine were named Heritage and Homestead, and the newest nine holes were named the Harvest nine. Sklarenko said the expansion of the course has allowed the club to offer a wider variety of holes. Dubbed the Ash Hole because it sits atop an old ash coal mine, Homestead’s Hole 7 is a par three measuring anywhere from 157 yards from the back to 108 yards from the forward tee. The hole plays from an elevated tee down into an undulating green, and according to Sklarenko the challenge is the club choice, which can change depending on the strength of the prevailing west wind. As for his personal favourite, Sklarenko said it’s Hole 5 on the Homestead nine. “The hole measures 308 yards from the back tee. The nice thing about this hole is all the water,” he said. “Water skirts the entire hole from tee to green along the right hand side. The hole is a huge risk and reward hole where a long hitter can hit the green in one with a challenging shot across the water. The distance to carry the water is approximately 250 yards. The hole generally plays directly into the wind. This is a very fun hole where eagle is a potential, birdie is there for the taking, but any miss hit changes birdie to double bogie with a penalty shot for hitting the water. This is a hole that is fun to play every day. As for availability, Sklarenko said the additional nine has given the club a distinct advantage over other courses in the area. “Monday through Thursday we do have league play each night, but with the third nine we have the option of still having 18 holes of play for our membership and guests,” he said. The club also offers members and guests a complete facility with a fully stocked pro shop with CPGA professional staff, a fully licensed restaurant and lounge with a sunroom and patio that overlooks much of the golf course, a sports lounge located on the third level of the clubhouse with two big screen TVs, a grass driving range with two hitting decks and a 115-yard short game practice area. This type of quality control and maintenance of the surfaces and grounds is extremely important to Picture Butte. “Our club and membership are proud of our reputation year after year as one of Alberta’s best conditioned golf courses offering superb value to our golfers,” said Sklarenko. The club looks forward to welcoming you to the grounds and giving you a memorable experience in south-central Alberta. Just over 20 km north of Lethbridge on Highway 25, a short 15 minute drive. Overall course condition improvements to the new Harvest Nine that opened for play in 2004, such as widening fairways and cutting down the natural grass to make it easier to find mishit golf balls. Men’s Scramble – First weekend of June. Ladies’ Scramble – Annual event that takes place during the month of May. Men’s Night: Tuesdays and Thursdays from 6 p.m.
Ladies’ Night: Mondays and Wednesdays from 6 p.m. Date Night: The last Friday of every month from 6 p.m. Regular lessons with PGA of Canada head professional and club manager Dean Sklarenko are available at the Picture Butte Golf Course. The regular lesson rate is $55 per lesson and group and couples’ rates are available. Instructional summer camps are also available. Dean Sklarenko of Picture Butte Golf Club gives his advice about risk and reward situations on the golf course.